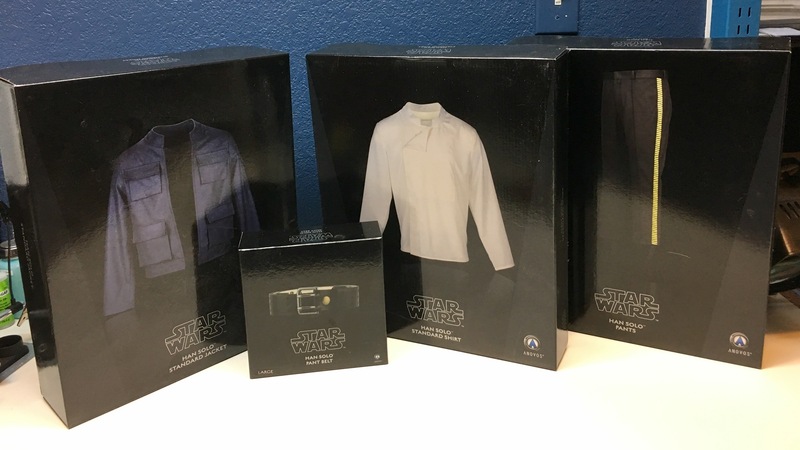 For my birthday last year, the family chipped in and preordered me the Anovos Han Solo Bespin Ensemble (standard line). The costume arrived just before Thanksgiving, so I was very excited to give it a test-fit and snap a few pictures. This a replica of the costume worn by Harrison Ford as Han Solo in The Empire Strikes Back, one of my favorite movies. 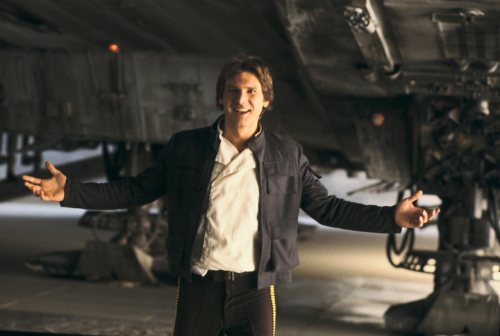 The costume consists of a cream-colored undershirt, a blue jacket, and Han’s trademark pants with yellow Coreillian bloodstripes. I also opted for the Anovos leather belt. Not included are Han’s famous gun belt, blaster, boots, and a Wookie. 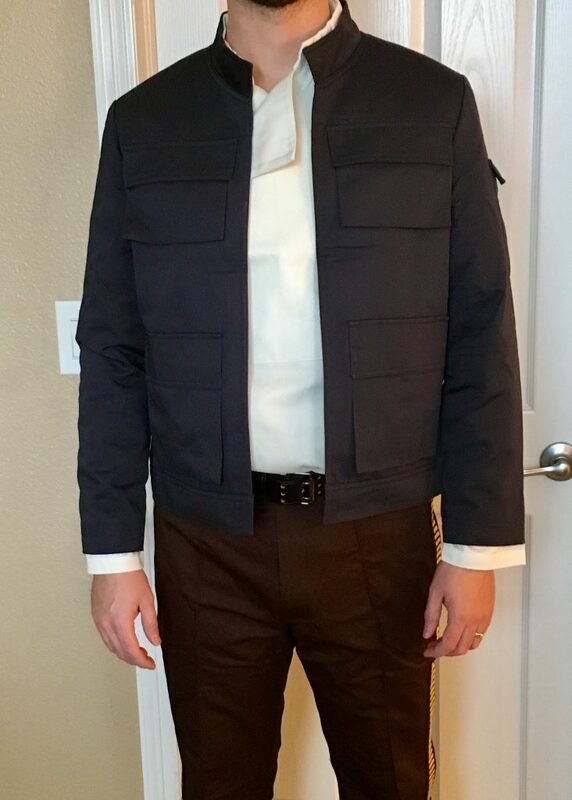 Being the standard line, as opposed to Anovos’s premiere line, the jacket and shirt are made from a less expensive, poly-cotton material. Nearest I can tell, the pants are identical between the premiere and standard lines as my packing slip referred of them as premiere line pants, so that’s a nice bonus. Consistent with all of the Anovos products I’ve purchased, the packaging is very nicely done. Each piece is contained within a cleanly designed box featuring a singular image of the piece with the Star Wars logo at the bottom. Inside the box, the piece is contained in a sealed plastic bag, which is then wrapped in Star Wars tissue paper – a nice touch. The belt is a nice weight of leather with metal detailing, giving it a strong and rustic feel – something you’d expect Han Solo to wear. Since Anovos was given access to the original costume through Skywalker Archives, I would expect the accuracy of the patterns hard to beat. The fabric has also been dyed to match the screen-used costume, so the colors look spot on. The detailing on all pieces is pretty amazing. Anovos even replicated the asymmetrical look of the hand-embroidered Coreillian stripes from the screen-used costume. 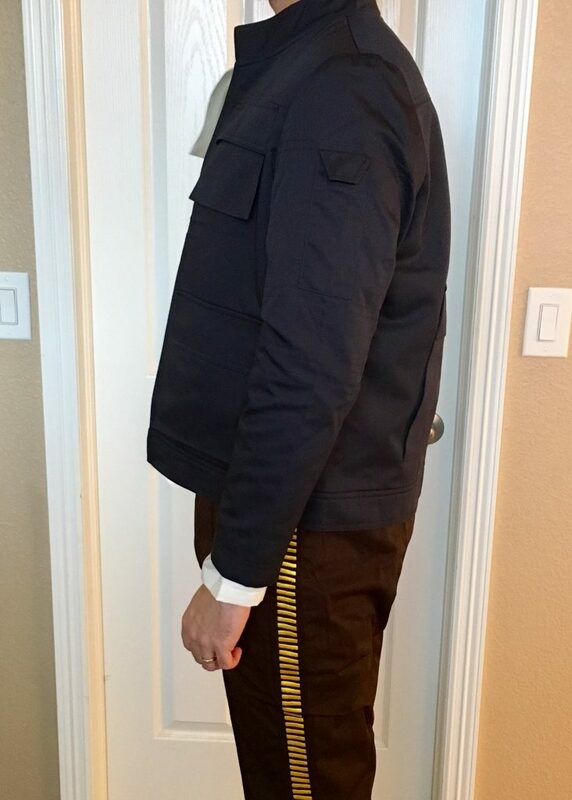 The jacket also has functioning pockets, which will be very useful when wearing the costume to a convention or event. The shirt fabric leaves something to be desired. I’m sure this is where the premiere and standard lines differ, but the standard line shirt fabric is almost see-through in some areas. Since the shirt is designed to be worn underneath the jacket, this is a minor gripe. I found the shirt to be a fairly loose fit throughout the torso and sleeves. Not a big deal as a tailor will easily be able to remedy this. It just seems the fit of the shirt differs from that of the jacket. 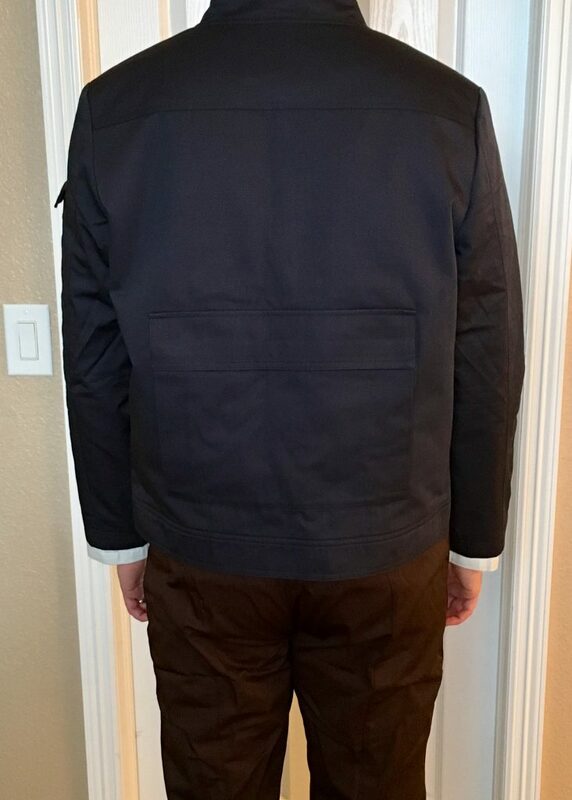 I ordered a large for both, and the jacket fits great right out of the box, where I’ll need to have the shirt adjusted. Being almost 6’3″, the stirrups at the bottom of the pant legs are entirely too short to be useful, so I’ll either need to remove them or have them lengthened. I’m confident the pants will fit just fine tucked inside an appropriate pair of boots, just some altering is required for the taller folks out there. The shirt features three snaps that secure the overlapping flap. However, they are fairly weak and came undone several times while I was trying on the costume. My plan is to have these replaced with stronger snaps and have additional snaps added to the opposite side of the flap when I have the shirt tailored. I think Anovos has done an excellent job replicating a very iconic costume. For the price, I think you’ll be hard-pressed to find a better looking Solo ensemble out of the box. I’ll be having the shirt tailored for sure, and may even have the jacket adjusted slightly depending on how the shirt turns out. 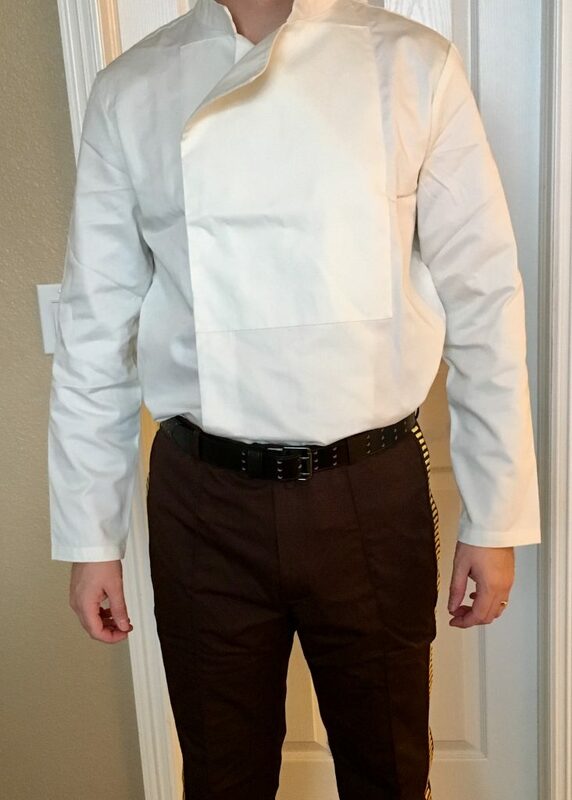 I also have a pair of boots and the Solo gun belt on order, so look for a write-up on the completed costume coming soon!